Businesses pay nearly two-fifths of all state and local taxes collected in Minnesota. 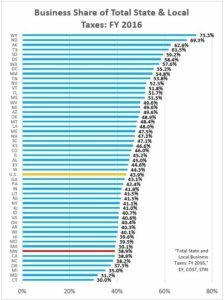 This is significantly less than the national average and less than in all but a handful of states. According to the EY report, 35.7% of fiscal year (FY) 2016 state taxes in Minnesota were paid by businesses, compared to 38.6% nationally. Meanwhile, 49.5% of Minnesota’s local taxes were paid by businesses, compared to 51.5% nationally. 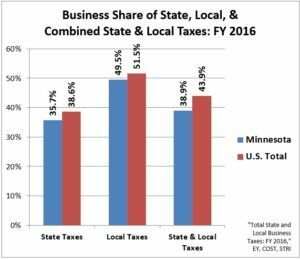 Minnesota businesses paid 38.9% of total state and local taxes in FY 2016, compared to 43.9% nationally. In other words, the amount of each dollar in state and local taxes paid by businesses in Minnesota is about 11 percent less than in the U.S. as a whole. At a superficial level, the findings regarding local taxes may seem surprising; after all, the primary local tax in Minnesota and most other states is the property tax—and Minnesota businesses pay higher taxes per dollar of taxable market value than do businesses in most other states. However, unlike most states, Minnesota does not tax commercial and industrial personal property (i.e., fixtures, equipment, and inventories), which gives Minnesota businesses—especially industrial businesses—a tax advantage relative to other states. Minnesota is tied with California for 45th in the share of state and local taxes derived from businesses in FY 2016. Only five states had a lower business share of total state and local taxes than Minnesota, while the business share in 43 other states and the District of Columbia were higher. It should be noted that not all states are created equal in terms of their ability to generate tax dollars from businesses. For example, energy-producing states in particular can impose high taxes on energy, since demand for energy is inelastic and consequently these taxes can be shifted to consumers, many of whom live outside of the state. As a result, these states are able to tolerate higher business taxes—and the share of taxes borne by businesses tends to higher than in other states. Using data from the EY report, it is possible to approximate the share of total state and local taxes paid by businesses in the U.S. excluding energy producing states. * Even after excluding these states, the share of total state and local taxes paid by businesses in the remaining states is approximately 42%—still significantly higher than in Minnesota. No single measure gives a complete picture of the relative level of state and local taxes paid by businesses in the various states—and the business share of total state and local taxes is no exception. However, based on other metrics from the EY report—such as the benefit that businesses derive from the expenditure of state and local taxes—Minnesota is not out-of-line with other states in terms of business taxes. *Energy producing states as used here include Alaska, Kentucky, Louisiana, North Dakota, Oklahoma, Texas, West Virginia, and Wyoming.